BC's wine country is a traveler's paradise. Spread across the girth of the province, from the Rocky Mountains to the southern tip of Vancouver Island, BC's wine regions encompass some of the province's most dramatic scenery. Patchworks of vineyards and fruit orchards span the Okanagan and Similkameen valleys, BC's largest wine-producing region, offering unlimited opportunities for sightseeing, wine festivals and seasonal wine tasting. 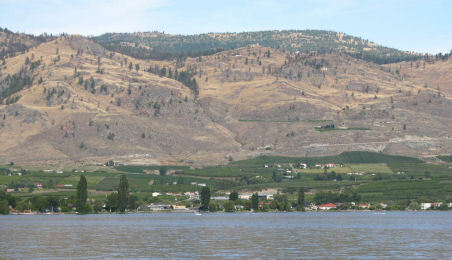 West of the Okanagan, is the Fraser Valley, which is known for its sweet wines Located an easy drive from Vancouver, the Fraser Valley experiences less snow and milder winters than the Okanagan. BC's Gulf Islands is the newest wine-producing region, with most of the wineries located at the southeast end of Vancouver Island. Mild warm weather helps to create its delicate fruit wines. The ingenuity and diversity of these three regions have led to some startling accomplishments for BC winemakers. Increased competition from international winemakers has forced local vintners to become more creative over the years, producing among other things, the Okanagan ice wine. Originally a trademark of German specialty winemaking, "Eiswein" is as it sounds: a delicate wine that has been produced from iced grapes. Canada is among a handful of countries blessed with the climate conditions to create an award-wining ice wine. There is no better way to become acquainted with BC wines than to sample one of its seasonal wine festivals. BC's warm-weather wine festivals offer the best opportunities for experiencing the Okanagan's exquisite scenery, while the winter ice wine festival at the Sun Peaks Mountain Resort attracts skiers and wine lovers from around the globe. Most of the wineries in the three regions offer tours and tastings of their own and some offer their own holiday events and dinners. Reservations are usually recommended. Copyright 1997-2017 Go Northwest, LLC. All rights reserved.